See the Pope’s Car in our Parish! 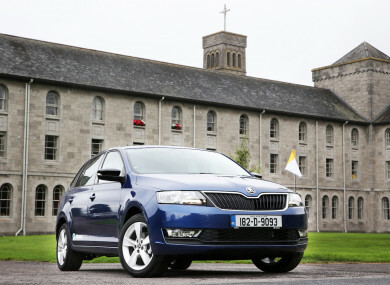 During his visit to Ireland last August, the vehicle used to transport Pope Francis to various places was a Skoda Rapid, as the Pope prefers to use relatively modest cars on all of his official trips. In all, four different cars of the same model were used at different location. One of these is now owned by Noel Deasy Motors in Cork city, who have kindly offered to display it in a number of parishes. On next weekend, February 16th/17th, this car will be displayed in Holy Rosary Church car park. The iconic Skoda Rapid Spaceback for Pope Francis was adapted to comply with exact specifications from the Vatican, featuring a specially wrapped (papal blue) finish and a specially shaped rear armrest. The tinted rear side windows were replaced with clear glass so that visitors could see the Pope. For the processions, chrome dowels were mounted on the front fenders of the passenger side, bearing the Vatican flag. This car is unique and is now a piece of Irish History that you can see and even sit in!